A trio of males gathered together in a North Dublin basement, celebrate Christmas the only way they know how, by playing cards and getting drunk. Conor McPherson’s The Seafarer is a brilliant script that is hugely entertaining, engaging and funny. Conor McPherson is no stranger to alcoholism having spent much of his life fighting this demon and knowing first hand the pain of searching for meaning and drinking to dull this pain. Blindness, loss, condemnation, forgiveness and redemption are all knitted seamlessly into the tight uplifting script that deservedly won The Seafarer many awards. The theme of loss and blindness is all pervading suggesting that ‘there are none so blind as those who will not see’. Drunkenness is not the only demon in the play as is evident in the stakes in the card game. 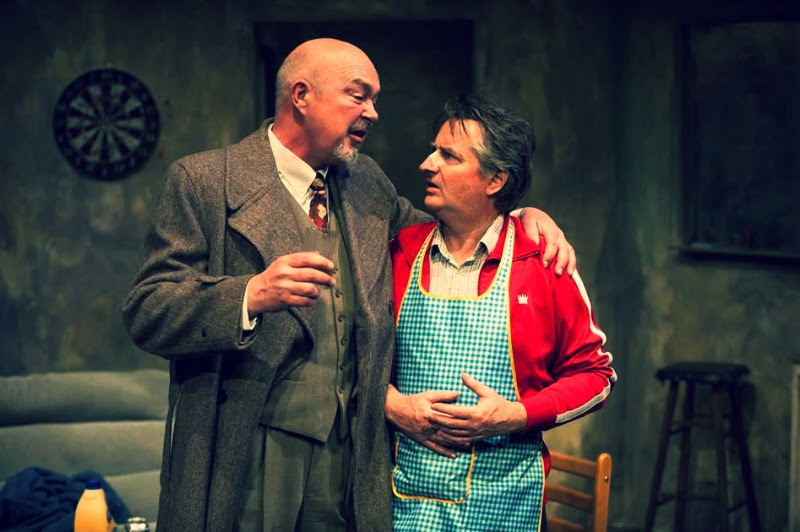 It is obvious that Director Wayne Pearn is at home with this script and he displays a familiarity with, and an obvious admiration for McPherson’s work, and he has chosen a stellar cast and forged them into a tight ensemble. Fortyfivedownstairs (theatre) is the perfect setting for The Seafarer, immediately drawing the audience into the intimacy of the performing space. George Tranter’s set was well suited to the performance space and kept the intimacy between players and audience throughout. It was evident from the start that the décor was devoid of a woman’s hand, and the pub souvenirs added to the overall ambience. The play bristles with the hard-bitten. Sharky (Barry Mitchell), sober for two days, is startled by the Lazarus like rising of Richard (Geoff Hickey) from behind the settee, severely hung over. Richard, Sharky’s brother, is blind, as the result of a fall into a dumpster at Halloween. This accident is likely the outcome of a previous drunken interlude. It is the morning of Christmas Eve and Sharky is attempting to restore order in the whisky-bottle and beer-can-strewn room. Down the stairs lurches Ivan (Adam Rafferty), a neighbour, nursing a thick head. He is bewailing the loss of his glasses and the likely repercussions of his failure to return home the previous night. It is clear, that in spite of his shortcomings in the family department, Ivan is a trusted friend of Richard. The Sacred Heart looks down compassionately on this scene, and a Christmas Tree sparkles in the corner. The play is set in Baldoyle, on the outskirts of Dublin in the shadow of Howth Head, or Ben Eadhair, a place of many myths and legends. The setting calls to mind the Hellfire Clubs of the 18th century, where so called aristocrats gathered to gamble and dabble in the occult. It is from one of these legendary stories of the supernatural that McPherson draws inspiration here, to great effect. In this supernatural vein, Ivan regales Richard and Sharky with an unsettling story of a mutual drinking acquaintance, Maurice Macken. Following a Christmas shopping expedition of the liquid variety, the trio are joined later in the evening by Nicky (David Passmore) and an uninvited stranger, the diabolically suave Mr Lockhart (Michael Cahill) who oozes charm whilst appraising Sharky in a knowing way. Richard’s show of bonhomie and hospitality towards these two is clearly not shared by Sharky. The whiskey and beer flow, tales are told and the card game gets underway. Hilarious light relief is interspersed throughout the play by Richard, Ivan and Nicky’s exiting to chase ‘the winos’ off the lane outside. The poteen is produced and tension builds as fortunes shift. From a tentative beginning, this performance gathered momentum and carried the audience along spellbound to the very end. Mitchell’s portrayal of Sharky is outstanding. From the outset it is clear that he is a troubled soul and his pain is evidenced throughout the play. His unvoiced love for the woman in Lahinch is palpable. His silences are as heart-rending as are his lines. Anger, frustration, hatred and tenderness are all expressed so convincingly that the audience wills him to be able to find some solace. Hickey as Richard metamorphoses from the wraith on the floor to become the voice of wisdom and wit, and a reassuring presence in the final moments as he prevails on them all to go and celebrate the birth of the Christ Child, and hopefully sample a glass or three of the monks ale. His impish humour was infectious and assured him forgiveness for his manipulative behaviour. Rafferty felt his way slowly into the part of Ivan, and then inhabited it with relish and assurance. In spite of his convincing drunk lurching down the stairs, he could perhaps have spoken a bit louder at this point. He gained audience sympathy by showing his obvious human qualities and leaving the theatre one hoped that the monks could broker a truce for him at home. Nicky is the catalyst, and Passmore convincingly filled this role as a fly-by-night, itching for action, without much substance and very eager to please and belong. His was a sharp contrast to the other roles. From Cahill’s suave assured entrance as Mr Lockhart it was evident that this was to be more than an ordinary card game as he set the pace for a character eventually stripped bare. His was the most extensive dialogue and much of it was spine-chilling in its effect. Suspension of disbelief is the aim in all good theatre and in this Pearn and Hoy Polloy’s The Seafarer certainly succeeded. Renee is a theatre director, and has often reviewed for Tinteán. Thanks. An excellent review of a fine play by a very gifted writer. The Weir is probably my most treasured new play of the last 20 years. Regards from Thom at the immortal jukebox.